Hesperaloe parviflora is an easy plant in the garden. The Red Yucca requires little water, minimal trimming and blooms Spring through Fall. If even a small bit of root is left Red Yucca will recover from a bout with gophers. I pull out or trim off the spent bloom spikes and periodically remove a dead leaf or two. The Red Yucca can tolerate heavy soils if irrigation is limited or the slope is adequate for drainage. Hesperaloe parviflora is tolerant of temperatures that dip into the low teens. 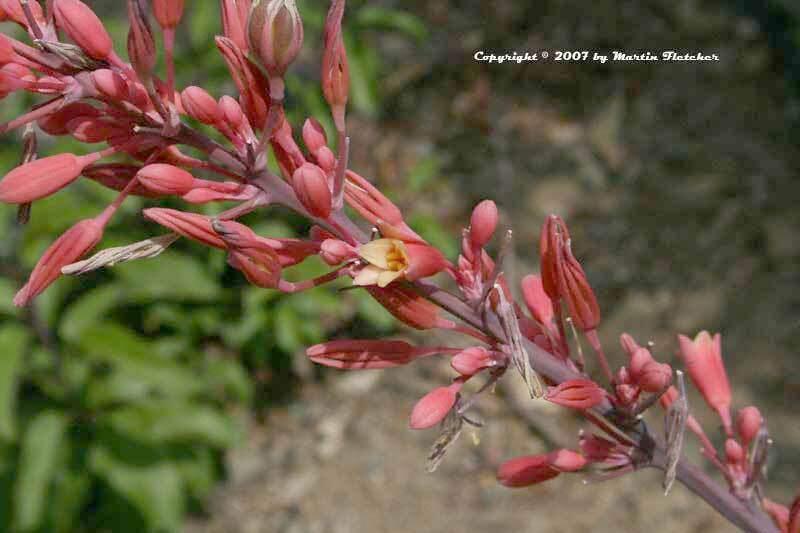 The Red Yucca can be propagated from seed or from divisions and often reseeds on its own, though not agressively.. Flowers of Hesperaloe parviflora - Red Yucca. High resolution photos are part of our garden image collection.